LED spot lights, LED light strips and “party lights” all contained in corner-mounted coving panels. We’ve been trying to reduce the number of seams and visible fasteners on the walls and ceiling. It meant creating 9 foot long fabric covered wall panels and using flanged l-track to hold things together. You still need fasteners where the walls meet the ceiling so we hid those behind some coving strips. 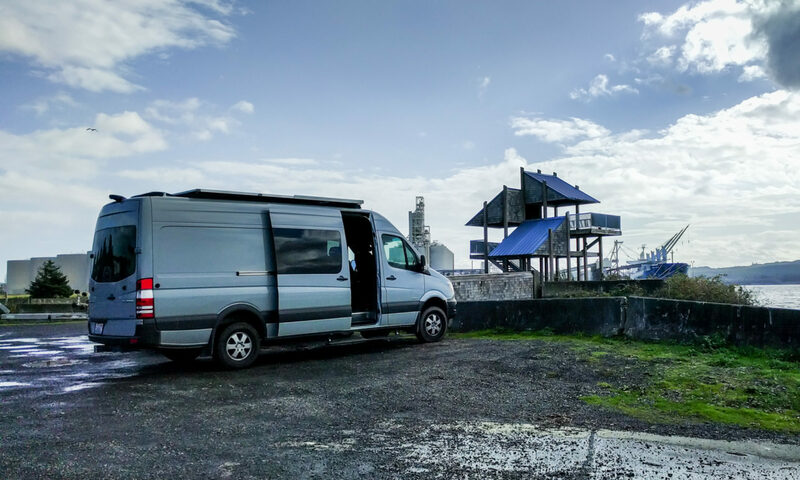 Everything in the van does double duty where possible. For instance the fasteners for the ceiling panels are also single l-track clips. For the coving, we created a mounting system that bolts to the wall and ceiling, simultaneously holding the panels up. The coving itself holds our spotlights, and the gaps between the coving and the wall and ceiling become places for LED light strips to shine through. The mounting brackets are made from spare pieces of aluminum siding trim that we had left over from our barn. It’s relatively thick commercial grade metal with a durable coat of paint. Of course, the bends were in the wrong places so we had to re-form it. Without a proper metal brake, we just used long strips of plywood clamped to the trim pieces and bent it by hand. That left a couple of kinks, but overall the shapes turned out just how we needed them. The coving itself is two layers of 1/8″ plywood glued together to create staggered joints. We needed one 9 foot length and one 14 foot length. I would not create a single 14 foot length again. It needed reinforcement at the staggered joints just because of how much it could bend along its length. We cut holes in the coving for our spot lights and then covered it in foam and fabric, just like the walls. We stuck aluminum tape on the back of the boards to reflect more of the LED strip light back out from behind the coving. We made use of an existing clip-like bend in the aluminum trim pieces to slot the coving on to the top bracket. The bottom bracket holds the coving in place using friction. There are three sets of lights. The spot lights (actually 60 degree flood lights) provide the most light. They are LEDs and do not produce very much heat. The white LED strips give a really pleasant diffused light. They are the same color temperature as the spot lights. The spot lights are not dimmable, but the strips are. That means we can dial the light up and down as we want it. We also added an RGB (variable color) LED strip on each side. There are all sorts of controllers for these strips but we chose to use a simple three-dial system which lets you manually choose any color you want and simultaneously teaches you color theory. They promptly got labeled as party lights! … not perfect, because the plastic cover on the B pillar extends further out, but good enough for us. Update 2: Enough people asked, so we made a template of this headliner-to-b-pillar piece so it’s easy for you to trace and make your own. 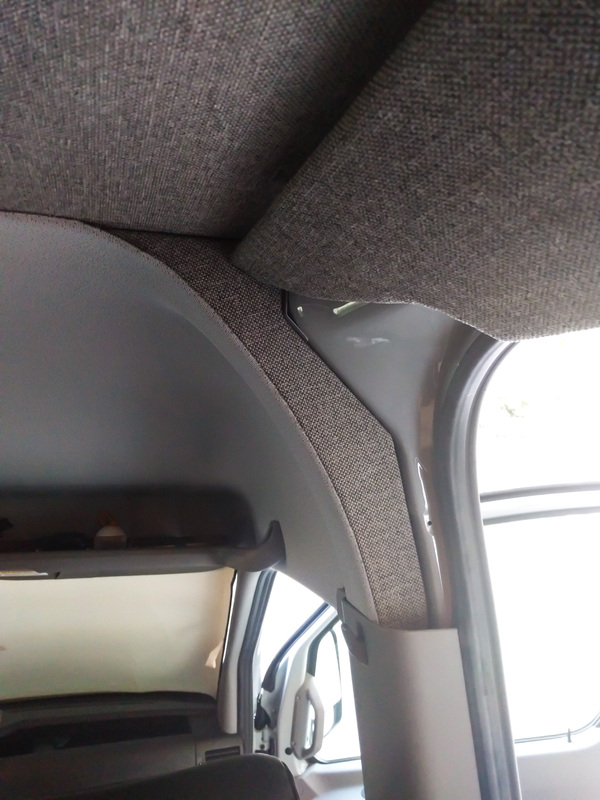 Can you show what you did for the transition piece between the cab headliner and the rest of the van? We are trying to find the cleanest way to keep the cab headliner and do a wood ceiling for the rest of the van. Thanks! On the driver side the cab headliner transition will eventually be hidden behind a cabinet, so we just stuffed that area with Thinsulate and called it good. We held it in place using VHB tape – basically, strong double sided sticky tape. I’ll take a photo of the finished piece when I get a chance, and update this posting. Edit: Updated posting to add a picture of the piece we built. Edit #2: We also made a template of the piece, so it’s easier for you to build your own! James, we used this fabric from Amazon. There are several other color and pattern options. The manufacturer (Kovi) sell it direct, but Amazon had a free shipping option, which made it much cheaper. It looks like that option might not be offered any more. Perfect Fit sell a cheaper version that looks just fine but is thinner. Get a sample before you buy. It’s available from other places too. It’s called Interweave, Church Pew or Automotive Tweed fabric. It’s Olefin or Polyolefin. How are you planning on fixing the coving in place? 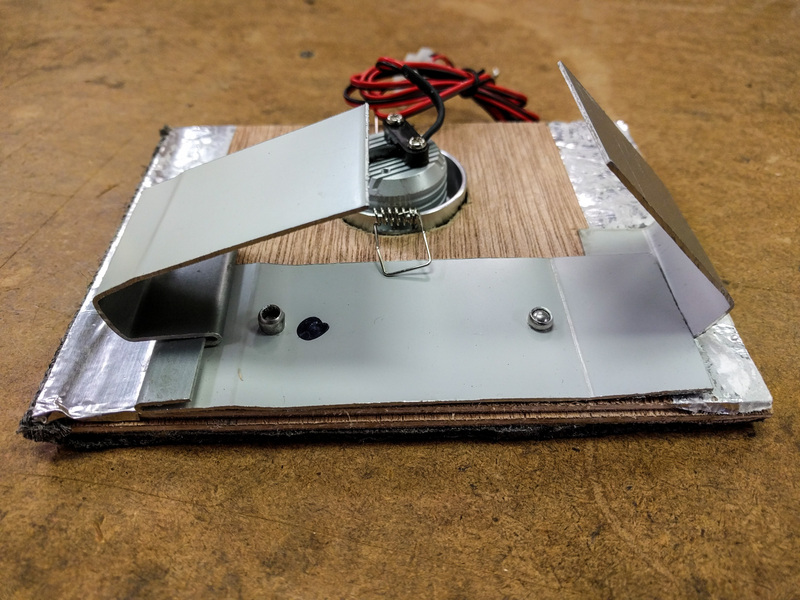 If we were doing it again, we’d use a hinge on the ceiling and a magnet or velcro on the wall, rather than going to the trouble of bending the aluminum to shape. Any interference fit in the van is likely to rattle. Solid attachment points are less likely to make noise. Basically I have a the tweed siding and a white aluminum roof. And my outfitter left out the trim. So I’m trying to figure out the best solution. I like your 45 degree trim. But trying to figure attachment points. James, I’ve never used it but I can imagine it would go well with the tweed and aluminum. It might be easier to use something like this that contrasts rather than trying to match the original tweed. 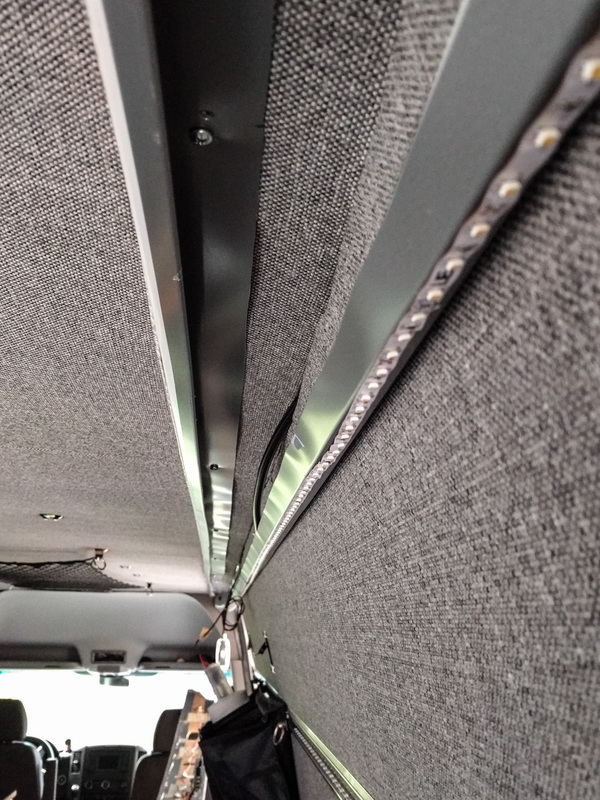 Did you use a bus bar to connect your ceiling lights in parallel? I’m trying to figure out how to join all the connections to the main feed. The ceiling lights we used have an optional 12v adapter that terminates in a socket that six lights can plug in to. So, we cut the wall wart off the end of the cable and used the length of wire and the socket as a type of bus bar. I think you’re right though. The easiest way would be to use a bus bar like Blue Sea System’s DualBus. Your site has been so helpful, thanks for all the time you put into sharing your build & knowledge. Glad you’ve found it useful. Your build seems to be progressing well too. So you have a page about mounting the ceiling panels themselves? I can’t find anything on that but I like what you did with it. Taco, I don’t think we ever wrote that up as a separate page. It was pretty simple. We just made panels from 1/8″ ply, covered them with foam and fabric, and attached them using the single-clip L-track mounts. Those L-track mounts are bolted into the metal beams in the ceiling using rivnuts. At the edges of the panels under the coving, the wall panels push up against the ceiling panels and hold them in place. We did use a couple of bolts to mount the coving supports and those provide extra attachment points for the ceiling panels too. How come you added L track instead of direct mounted to the rivnuts? Do you have any tricks for lining the holes up? We wanted to minimize the number of exposed bolt heads. 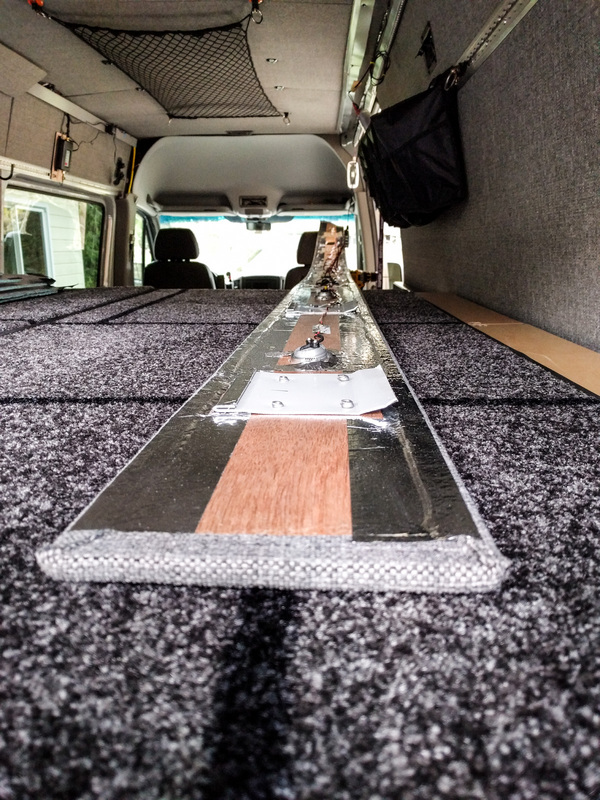 The single-mount L-track pieces hide the bolt heads, add an attachment point for other stuff in the van, and provide a bigger surface area for holding the ceiling panels in place. There are several ways of lining the holes up, but the easiest is to use a hole finder, which you can read about here. where did you get the switch panels with toggles and dials? can you dim the LEDs with that? this is a great site. very good info. thanks for posting. We mounted an LED dimmer to one of the plates, so yes we can dim the LEDs.